A new survey from the Dallas Federal Reserve Bank shows oil producers in Texas and Oklahoma are continuing to thrive amid the moderate price environment, as efficiencies in production and resource-rich shale basins drive breakeven prices to all-time lows. Titled “Momentum Builds for Oil and Gas Activity,” the Dallas Fed’s latest energy survey also found robust growth in business activity and production among producers, illustrating the resiliency of Texas oil and gas development. Collecting responses from 150 oil producers and service companies, the breakeven and profitability prices reported are no less than staggering. According to the survey, operating costs among U.S. shale regions dropped to between $24 and $35 per barrel for new wells this year. 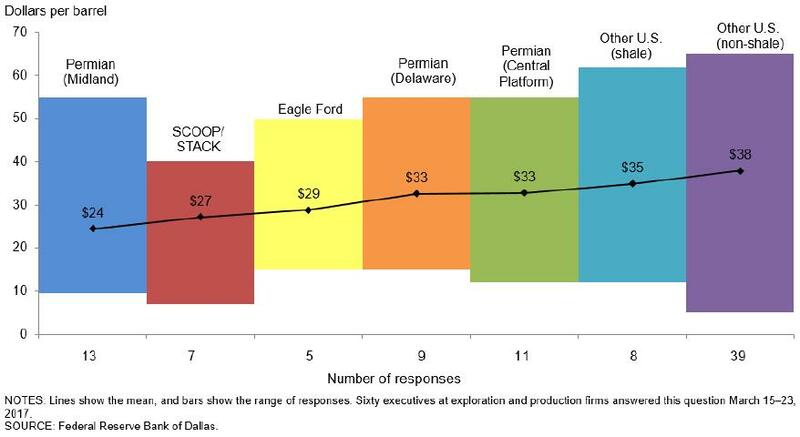 West Texas’ Permian Basin is leading the pack with an average breakeven of $24 per barrel within the shale’s Midland play. Oklahoma’s SCOOP and STACK plays also reported an incredible average breakeven price of $27, while the Eagle Ford in South Texas is not far behind, averaging $29 per barrel. Notable too, are the prices to profitably drill a new well. According to the survey, breakeven prices for new well profitability across U.S. shale plays averaged between $46 and $53 dollars per barrel. Again, the Permian’s Midland play recorded the lowest new well profitability level at $46 per barrel, with average breakeven prices in the Permian dropping six percent since last year. As operating costs continue to decline, shale plays across the country that faced challenges from harsh market conditions just a year ago are now bustling with activity. According to Baker Hughes’ latest rig count report, the United States has added 345 rigs since March 2016 – that’s an astonishing 74 percent increase in just one year. Moreover, Texas alone makes up about half of all U.S. active rigs with 404, up 195 from a year ago. The Permian is the main driver behind this increase, growing by 168 rigs since 2016, more than doubling in size to make up over 75 percent of all active Texas rigs. Looking ahead, the survey also shows the optimism energy developers have for the strength of Texas oil and gas production. Half of exploration and production companies who responded to the survey reported an improved overall six-month outlook, while almost 70 percent of service firms reported an improved outlook. There’s no question that low prices still pose a challenge to oil and gas development. But with efficiencies in production and our state’s abundance of resources continuing to drive down costs, the future of Texas oil and gas development remains strong.